Statistical Analysts OptaJonny have selected their team of the tournament, with some notable omissions. With the Six Nations finishing, the inevitable ‘teams of the tournament’ spring up everywhere and with Ireland winning the Grand Slam, most selections include Irish players like Conor Murray, Tadhg Furlong and Johnny Sexton. Well not according to Opta Jonny, who did indeed select Murray and Furlong, but no Sexton. He guided Ireland to their first Grand Slam since 2009, so his omission is perplexing – but Opta’s Index system claims Italian fly-half Tomasso Allan was the best ten in the tournament. Some other notable exclusions are Alun Wyn Jones, and Keith Earls, with Cory Hill and Jonny May taking those positions. Both have caused considerable debate. But there were some positions that cannot be argued with, like Murray, who was the best player in the tournament according to their stats. Jonny Gray made a ridiculous 100 tackles during the Six Nations, the first man ever to hit the triple-figure mark. He only missed three for the entire tournament. CJ Stander is a no-brainer too. He made an astounding, tournament-leading 96 carries in the tournament, which was eight off tying his own record for a single Six Nations Championship. In fact the XV has several other interesting aspects to it. Such as the inclusion of five Scottish players, Stuart McInally, Gray, Hamish Watson, Huw Jones and Stuart Hogg. That means Scotland had one third of the positions which was more than any other country. Ireland had four, and England, Wales and Italy all had two each. Sadly there are no Frenchman, with Mathieu Bastareaud, Guilhem Guirado and Remy Grosso probably the only players standing a chance of getting in. Do you agree with their team of the tournament? Who made it into your team? 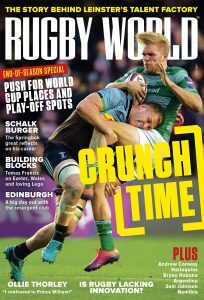 Don’t hesitate to let us know, and also don’t forget to follow Rugby World on Facebook and Twitter.